Captain America: The First Avenger was pretty low key. A little bit twee and humorous as well as largely harmless. At least Chris Evans (as with Rob Downey Jr. and Chris Hemsworth), proved a great casting choice for Marvel Studio’s juggernaut of heroes brought to life on the big screen. The thing was though, compared to the booming Iron Man films, the mega-popular Thor and the super hero blockbuster to end all blockbusters; The Avengers, Captain America’s origin movie was mainly uneventful, even for a “Phase 1” flick. But you can’t exactly make such a character that glamorous anyway can you? I enjoyed it and while it was admirable in forging its own vibe (that of a glossy WW2 matinee), it ultimately seemed plodding and lacking purpose. Ironic, considering it sets up a lot of the ground floor elements for the entire Avengers universe. I approached this second instalment, The Winter Soldier, still with anticipation of where Marvel could now take their potentially most interesting Avenger, but also with a decent level of what I considered justified trepidation. After I sat through it however, the latter proved quite unnecessary. This film echoes the blueprint of the classic sequel, the distinctive second or ‘middle film’, and ends up being the most mature and one of the best executed of all ten films thus far released by the studio giant in their huge intertwined Avengers franchise. But let’s not forget that this is still yet another super hero film and a lot can be said for over-saturation. A tricky balance of making billions and satisfying fans is something Marvel seems to be successful enough at, usually by having sly wit and jaw dropping CGI to cover major hiccups or plot holes. I have for a while now though approached each new film with great scrutiny, when in the past the spectacle alone and love of comics had me ready to plunge down a lobster or push play. It’s getting harder to apply the context to something that constantly plays out the same only with different backdrops. If I can’t justify anything beyond that these days, I’ll tend to ignore or put some of the newer films on the back-burner. There’s much more purpose and bigger picture stuff in Winter Soldier compared to it’s predecessor, not to mention the excellent, combat heavy action sequences. All reasons I found it so refreshing. With a blockbuster, you can’t really escape “formula” of course. Even the best Marvel films have still openly required themselves to subscribe to a level of purposeful formulaic momentum. But there is room to move in it, and it’s usually only when a franchise is established, it will start to morph into something more unique (take the X-Men franchise for example). And it takes somebody with the balls to do it of course. The return to form, but imperfect third Iron Man film does such a thing. Mainly due to enlisting – and allowing – a fresh, exceptional talent to invent within said formula. In IM3’s case it was much respected writer/director Shane Black, and what he delivered was something that was Marvel through and through, but achieves much broader things in terms of story, humour and direction. He put his personal stamp on it and it worked (for the most part). Captain America has done mostly this with its second film; albeit on a completely different tonal plane and in a much more subtle manner, and less about a personal stamp than an unwavering concept of genre. Once again, it’s due to Marvel taking that chance with directors that almost always seems to pay off – something that has been nothing short of inspired most of the time. The directors (s) in this case, Anthony and Joe Russo, are hardly household names, but their experience says something about being the unique choice for this, and now the upcoming third CA film. Primarily know for television work, the brothers have hands in several episodes (including pilots and finales) for Arrested Development and Community. TWS proves they aren’t so bad at action thrillers either. Writers, Christopher Markus and Stephen McFeely, who have penned three other Marvel movies including the first Captain America, set the agenda clear from the start. Specific in wanting a sub-genre present and intentionally channelling 1970’s political paranoia films such as The Parallax View & Three Days of the Condor, that room to move I mentioned has been filled with intelligent dialogue and handled with dead seriousness; all which works in its comic book film favour. Even to the point of casting Hollywood legend and Condor star, Robert Redford, in an integral role as S.H.I.E.L.D. honcho Alexander Pierce. His presence brings unsurprising weight and rather than phoning it in too much, Redford solidly takes on the responsibility professionally and convincingly. Samuel L. Jackson’s staple Nick Fury gets plenty of screen and story time and as usual, he is characteristically watchable. Scarlett Johansson is employed to link The Avengers/S.H.I.E.L.D a little more familiarly for the audience it seems but also to fill a void of an in-the-mix confidant for Cap which the lack of possibly hindered the first film a bit. Not to mention some male eye candy to counter Chris Evan’s ripped specimen for the ladies. Other faces including Anthony Mackie and Cobie Smulders are good and welcomed in an instalment that will have plenty of repercussions for future Avengers films of every ilk; story and tone wise. Of course, despite the significance and entwining nature of the storyline, this remains Steve Rogers aka Captain America’s film, and fans of the character are given a treat to see him finally start acting the reputation. Evans’ rises to the challenge. Whether it’s his charisma and physical strength working better to ensure Rogers’ is likeable, infallible and heroic throughout, or simply through the film-makers deciding to use his most iconic appendage – his shield – as more of an offensive weapon this time around too. Finally we see the shield come to life in the way we all know it deserves too. And Rogers himself wreaks havoc on any poor fool willing to give him a shot. We’re talking about a super solider after all, and as expected the directors have taken the gleeful approach to Cap laying the smack down more and better than he’s done in his other two appearances. No mercy is shown and the body count is refreshingly high in The Winter Soldier. I wouldn’t go so far as too call it brutal, but many of the fight scene choreography are of the highest duke ‘em out variety with Cap an expert at delivering it. What makes it all the more fun, is our titular villain, the winter soldier himself (played by Sebastian Stan), is no pushover and is a perfect nemesis in both strength and coldness. A set piece between them at the centre of the film is quite superbly orchestrated, if maybe a little brief. When the smoke clears after two plus hours, you can’t deny it is still mostly brain-at-the-door stuff, with holes, but it doesn’t insult you. That context again. Stripped down, this is simply an excellently directed action thriller. Take away the costumes, tone down the gloss a bit and put Matt Damon in this, and you’d be forgiven to think some scenes were straight out of Bourne. Such is the dominating fervour of Rogers when he’s ready to take names. He is unstoppable and incorruptible. 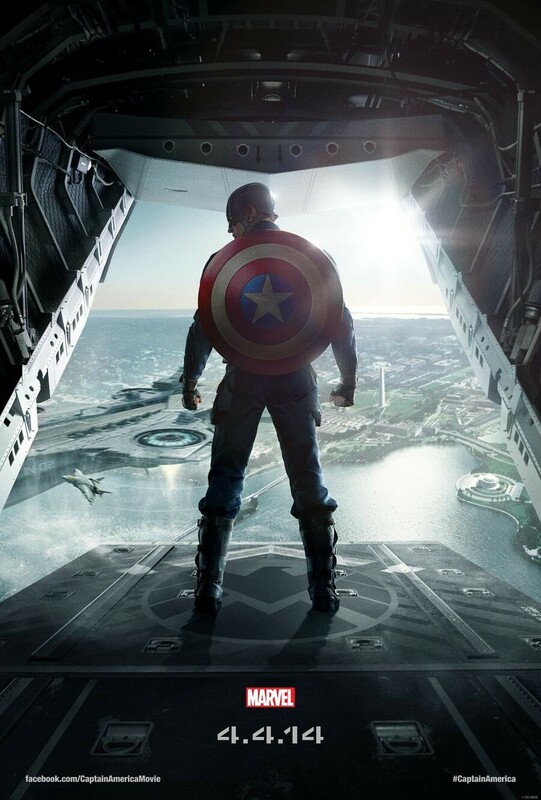 This is the Captain America film fans have waited to see. Along with Iron Man, The Avengers and the recent Guardians of the Galaxy, The Winter Soldier is the best Marvel has delivered thus far. This entry was posted in Film Reviews and tagged Action, Anthony Russo, Blockbuster, Captain America, Chris Evans, Comic Book, Film Review, Joe Russo, Marvel Studio, Nick Fury, Robert Redford, Scarlett Johansson, The Avengers, The Winter Soldier. Bookmark the permalink.